and destinations along, or close to, the route. These include Blanchardstown Town Centre, Blanchardstown, Castleknock, Connolly Hospital, Dublin City Centre, Donnybrook Village, RDS, as well as UCD itself. The corridor is already a busy transport artery and additional capacity is required to cater for travel growth predicted along this corridor. Two of the key features of a BRT system are frequency of service and reliability of journey times. The Blanchardstown to UCD BRT service is intended to operate at a frequency of approximately every four minutes in the peak hour and the target journey time from Blanchardstown Town Centre to the City Centre will be about 35 minutes – a reduction of about one third or more from current bus journey times along this corridor. 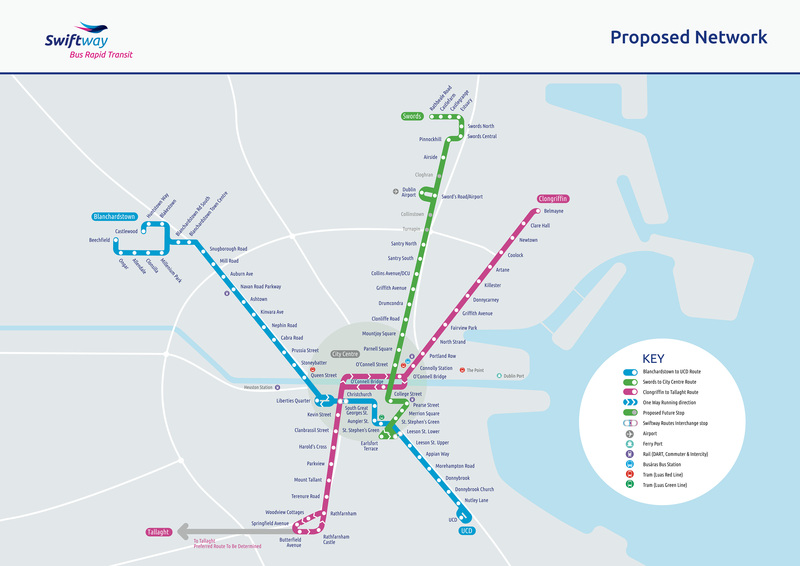 The Clongriffin to Tallaght corridor serves some of the key development areas of Dublin. These include the Clongriffin/Belmayne/Northern Cross areas on the north side, the Docklands area in the City Centre and the corridor from Terenure to Tallaght on the south side. 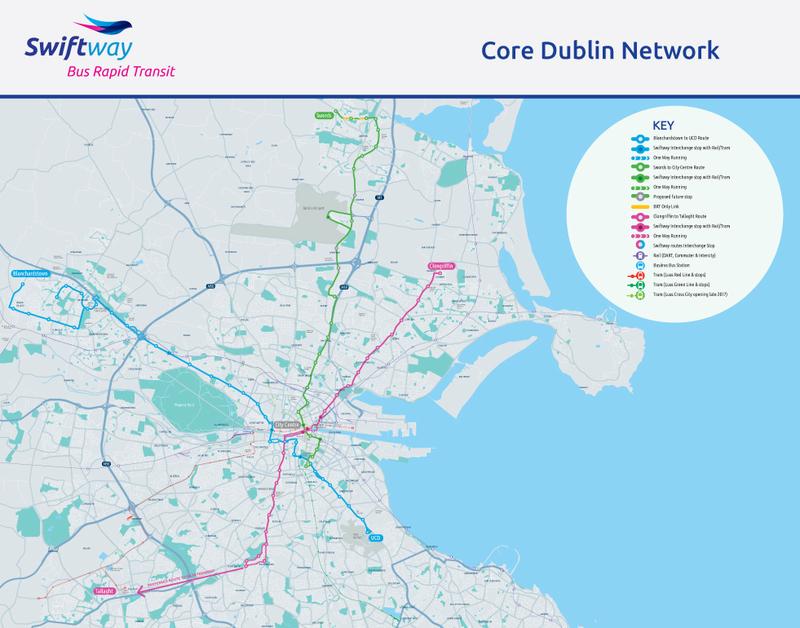 This corridor is already a busy transport artery, both north and south of the River Liffey, and additional capacity is required to cater for the travel growth predicted along this route. Two of the key features of a BRT system are frequency of service and reliability of journey times. The Clongriffin to Tallaght BRT service is intended to operate at a frequency of approximately every four minutes in the peak hour, and the target journey time from Clongriffin to O’Connell Bridge will be approximately 30 minutes – significantly less than the current bus journey times along this corridor. 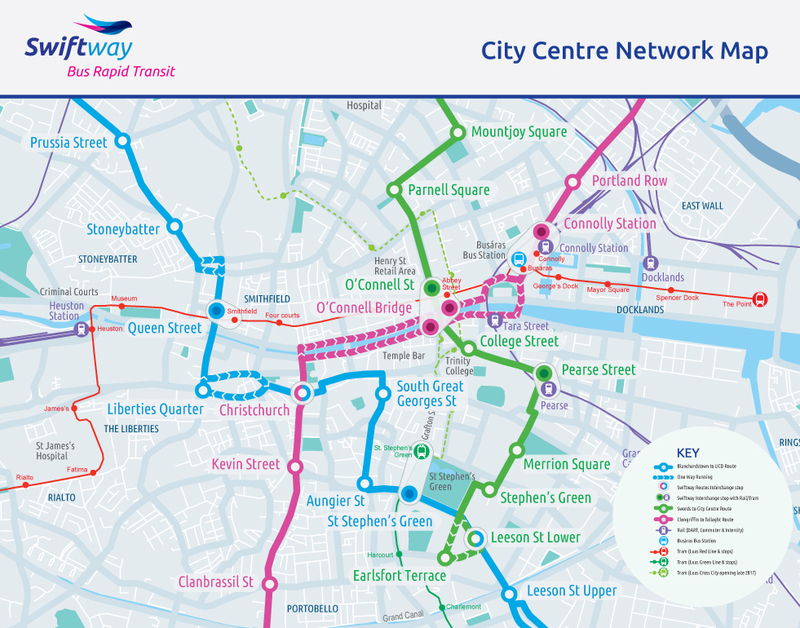 Why Swords/Airport to City Centre? The corridor is already a busy transport artery and additional capacity is required to cater for the travel growth predicted along this corridor. While a rail based solution will be required in the long term, bus rapid transit can provide an attractive public transport service for the short and medium term. / Airport to City Centre BRT service is intended to operate at a frequency of approximately every four minutes in the peak hour and the target journey time from Swords to O’Connell Bridge will be approximately 35 minutes – a reduction of about one third from current bus journey times along this corridor.